A number of our KES coaching staff have been working hard above and beyond the classroom. Many faculty coaches received recognition and opportunities for training at the highest levels, outside the realm of our School sports. Senior School teacher and our biathlon head coach and head of our equestrian programme, Karen Jones was awarded the NSSAF Outstanding Service Award for her coaching at KES. She was also accepted as a Coach for the Development of Elite Athletes during the Biathlon World Cup competition in Canmore, Alberta this past winter through the generous support of Sport Nova Scotia. Madame Jones coaches first-class biathletes at KES (including her daughter Katrena) which culminated in great results at Provincials, Easterns and Nationals this year. Senior School Mathematics teacher and head coach of cross country running and the recent Provincial Championship KES Track and Field Team, Phillip Hadley was honoured in December 2015 by being accepted into the highest level of coaching certification available worldwide by beginning his IAAF Level 5 Endurance Coach Course with some of the very best and brightest coaches in the world. He had the opportunity to study under the tutelage of one of the living legends of track and field, Joe Vigil. Many of the lessons learned by Mr. Hadley, while attending this intensive programme in Florida, lead to some of the successes of our track team in winning the Provincial Team Championship Banner, the first in more than 40 years for our School. He will be following up this summer completing and submitting his final project. Rookie Junior School teacher, Ryan Alguire, headed up our Duke of Edinburgh Program this year, was head of a very busy and successful developmental hockey programme as well as assistant coach with the Senior Boys’ Rugby team in their successful Division I Regional Championship win. He was a standout official both on and off the rugby field; he was elected to the Nova Scotia Referee Society as the “Director of Development” and he was the ‘Official of the Year’ for Rugby Nova Scotia. He has worked to improve rugby officiating at all levels by providing support and referee coaching throughout the last two seasons. He was also invited to referee at the Rugby Canada Centre of Excellence in Langford, British Columbia, and the annual New York Seven's tournament in November at Randall's Island Park, Manhattan. Ryan was certainly the best official in any of the rugby matches our teams attended this year. Director of Athletics, Geology teacher and head coach of our KES Wrestling Team, I was recognized by Wrestling Nova Scotia with the coaching award of excellence with the Coach Dedication of the Year Award, presented in April at the annual awards banquet. I have been busy as head coach, preparing the Nova Scotia wrestling contingent for the 2017 Canada Summer Games in Manitoba. This will be my last of three stints as head coach. I returned in April from the National Championships in Calgary with great success and another athlete with a Gold Medal as part of our KES club programme – The Windsor Mat Kings. I continue to provide leadership to wrestling coaches around the Maritimes, as a Master Course Conductor for the National Coaching Certification Programme. I am hopeful to have some of my KES wrestlers make the jump to the Canada Games Team in the upcoming season. There are a few KES wrestlers who will have a great chance. Unfortunately, this opportunity cannot be extended to our international students, although they can surely benefit from the many training opportunities afforded the games aspirants. 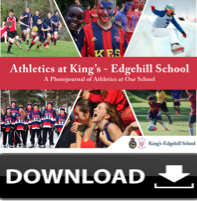 King's-Edgehill School coaches are passionate about sports and fitness. Your child can participate in a sport recreationally or competitively. Some of the many sports offered include soccer, swimming, hockey, equestrian, track and field, wrestling and many, many more options. Download our Athletics PhotoJournal to find out more.